Just some funny things the boys have done this past week. This is the train bucket that we keep all of the small magnet trains and tracks in. The other day Grayson dumped everything out of it and crawled in. He then couldn't get out, he could swing one leg over but not the other. So he was screech until I came and helped him. This was his entertainment all day. When Damon and Xavier come home from school they get a little TV time before homework and chores (I know thats backwards for most people but it works for us.) Grayson can now climb up on the couch and I just think its so cute that he wants to sit with his brothers and hang out with them. Don't ask me why his shirt is off. Aiden and Grayson have both been sick over the weekend. Aiden loves to sleep on the couch when he is sick so here he is. I just love that he has his little legs crossed. He does some funny things in his sleep. I posted this on Facebook but it was just too funny, Saturday night Grayson kept throwing up so I was walking around the house with a towel and cleaner all night cleaning everything up. With one of the last episodes Damon walked into the room and saw me cleaning it up and said, "I'm glad I'll never be a mother." and walked right back out. It was a glamorous day. That night when I was trying to get Aiden and Grayson to bed and clean up a lot of vomit, Damon and Xavier sat at the dining room table and started making cards and signs to wish their baby brothers better. It was sweet. It would have been even more sweet if they wouldn't have kept asking me how to spell things while I was repeatedly giving a sick baby a bath (He got 3 that night back to back!) but still sweet. This morning Damon was taking cough medicine and going on and on of how disgusting it was. Aiden then takes his and says to Damon, "Yum, You want mine?" And amongst all the craziness, Grayson learned to go down the stairs. He's been climbing up them forever but never braved going down. (I think falling down the stairs one time can make a kid a little scared.) Anyway, he used to sit at the top of the stairs and scream until someone took him downstairs but now he can maneuver all by himself. "First if I won a million dollars I would buy a wii and a DS and I would game. Then I would play games all day. Last I would eat while playing games." Thank you Damon for proving the point of why we will never have a game system. This has been on my mind for about 3+ years now. So after the little incident I had at a football game last night I'm going to put my thoughts on my blog. Its my blog, I can do whatever I want! Anyway, the following scenario or something similar to it happens to me a lot. Like weekly. And has since I was pregnant with Aiden. It doesn't matter if we are at a restaurant, a family event, church, Wal-Mart, etc...you get the idea right? Total stranger says to us, "Wow four boys." We always smile and say "Yep, four boys." They then look at me, very sympathetic and say, "I'm so sorry." Sometimes I just get the sympathetic look with an, "Are you going to try for a girl?" or "Are you done yet?" Or whatever stupid thing people say that they think is their business. This has got me thinking over the years. When people say things like this to me they are really putting down my boys. They are really being insulting. I'm sure they don't mean to be insulting. But if you think about it, they are. They are implying that something is wrong with my family. There is nothing wrong with my family, there is definitely nothing wrong with my children. And a family doesn't need to have a little girl toddling around, "to be complete." Which brings me to what happend last night. This mom at the football game told me I was her fear. She is currently a mother of two boys. She doesn't want a third child for the fear that it will be another boy. At this point in the conversation I realize she thinks I just have three boys so I correct her and say, "Actually, I have four boys." And she says, "Ugh, no way! I could never have four boys! Don't you just look around and see the little girl that is missing?" No, I do not. I see nothing missing from my family and I would not trade any of my boys for a girl, which is really what it sounds like when people comment on my four boys. Should I sell one, give him away, whatever because we had another boy? Honestly, I don't know if we are going to have another child or not. If it happens, it happens. Do I want a boy or a girl? I really don't care. (Although we are TOTALLY out of boy names!) I'm just grateful to have four HEALTHY children. In my little habit of blog-stalking people I've realized there are so many sick children in the world, how can I complain or desire a change in my children when, if nothing else, they are healthy and happy? So if there is another baby Dolezal in our little world, we won't care if its a boy or a girl (whatever it would be, it would have to like trains anyway). We'll be happy with whomever Heavenly Father gives us. I don't know if a family of all girls gets the same attention as a family of all boys. Please share your experiences, I would love to hear them. This blog post really got me thinking more so about my experiences with people, because when you have a large family you get a lot of stares and comments. I love this mom's response to people. It was quoted by Elder Anderson in our last General Conference. If an apostle reads it, its worth your time right? The boys and I went on a little trip yesterday with some friends to go to a Pumpkin patch. The one we went to is close to my hometown so I called my sister to meet us there. There are a lot of things to do, I can't even remember everything we did, but the boys had such a good time that they slept the whole way home. It was awesome! Especially since our DVD player wasn't working. Aiden jumping on the big balloon thing they had. Aiden and Grayson loved the goats. Aiden kept feeding them, I don't know if he was suppose to do that but I'm sure he isn't the only kid to do it. They had such a good time they asked if we could come again on Saturday. It isn't going to happen. But I'm glad they had a good time! Maybe next year we can go on a weekend, the boys really want to zipline. I'm not sure where this week has gone but I probably should have got these pictures up earlier. But seriously, its Thursday? When did that happen. Saturday we headed down to Jasper MO for a family reunion. I have a lot of cousins in the Jasper/Joplin area and we never get to see them except for funerals. So with the help of Facebook, we planned a little family reunion that didn't involve a casket. Many of them I haven't seen since before my mom passed away which would be around 20 years. We took family pictures, its my blog so I'm just posting mine! I'll post the group shot everyone when we get that. There was a lot of us! Me and my sisters! The Hobsons are known to play a mean game of Spoons. So we decided to have a spoon tournament in my mom's memory (rumor is, she was the best at the game). My sister Carrie made a trophy using one of my mom's angels from her collection and a little spoon glued to her hand (hope thats not sacrilegious!). My cousin Alan was the winner, here he is being awarded. Aiden and Grayson running around with Jax. They seemed pretty excited to see each other. 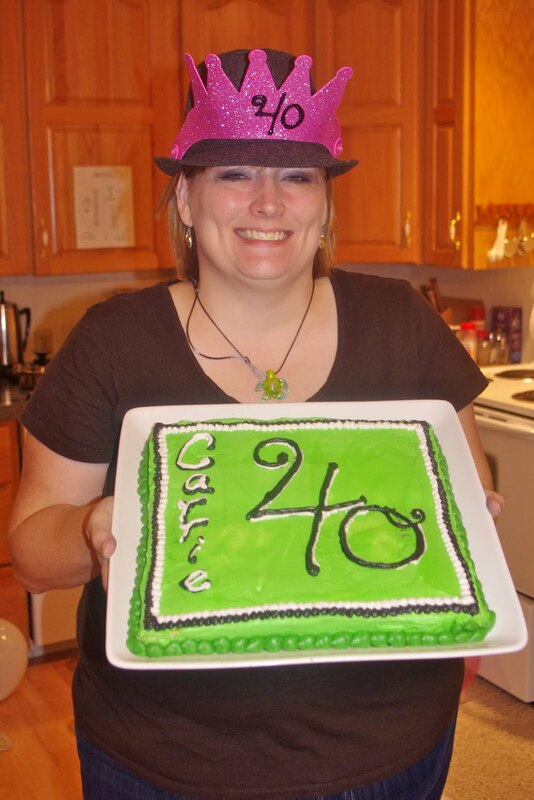 On Sunday we threw Carrie a (not) Surprise Birthday Party. 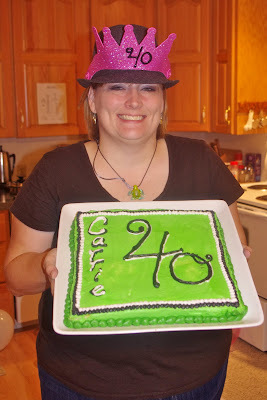 Monday was her BIG 4-0! Charla, Matt and I got together with my parents to do a little dinner party with family and some friends. My dad grilled steaks and Charla and I made side dishes. Got them in one blow! Unfortunately, someone ruined the surprise at the Family Reunion but we still had a good time even though it wasn't what we wanted to do.